A few weeks ago, we had some rainy and dreary weather. 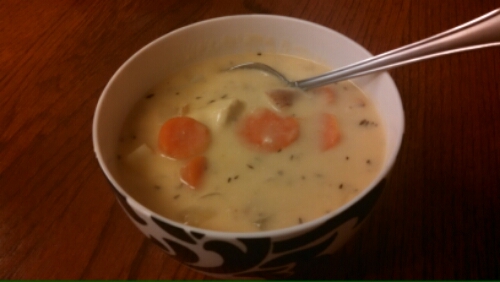 Thick soups and stews are PERFECT for those kinds of days…at least, in my opinion. 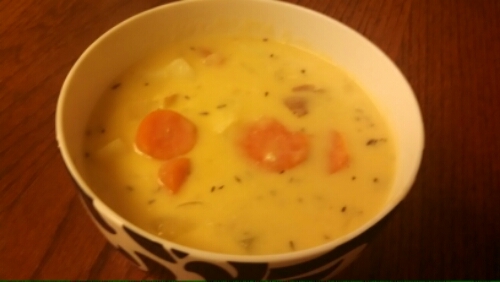 Thankfully, one of those dreary days, I had an abundance of potatoes in the cupboard and chicken in the freezer, which was perfect for this Chicken and Potato Chowder by Damn Delicious. Let’s just say…it was delicious. Seriously. I added some extra spices, but I don’t remember exactly what, so I’ll just post the recipe as-is from the original blogger. But it was a great flavour combo and so cheesy, too! The chicken broth added a ton of flavour (broth really does make my job easy, hehe). I loved the cheese addition. But I love cheese, so that’s not really a surprise. I used a mix of nonfat milk and half’n’half, because we didn’t have enough milk. But it was a great mix, because it added some extra creaminess without being incredibly fattening (then again, let’s be honest – when you go to hearty soups and stews, you’re usually looking for comfort!). Also, the original recipe calls for russet potatoes, but I used reds – I’m pretty sure you can just use whatever you have on hand. I also didn’t add my carrots until toward the end – I like them to be crisp tender, not super mushy. Finally, I used dried parsley, because I didn’t have any fresh. Oh well. Bookmark this for the next dreary or chilly day – you won’t regret it! -Melt butter in a large stockpot over medium heat. Add onion, carrots and celery. Cook, stirring occasionally, until tender, about 3-4 minutes. Stir in thyme until fragrant, about 1 minute. -Whisk in flour until lightly browned, about 1 minute. 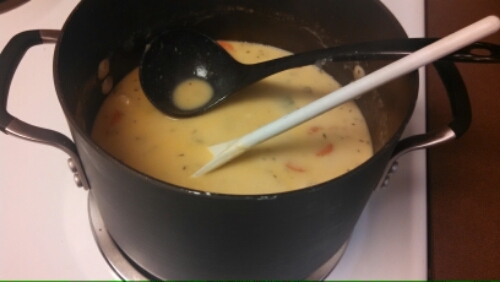 Gradually whisk in chicken broth and milk, and cook, whisking constantly, until slightly thickened, about 1-2 minutes. Then stir in potatoes. -Bring to a boil, then reduce heat and simmer until potatoes are tender, about 12-15 minutes. Stir in chicken and cheese, a handful at a time, until smooth, about 1-2 minutes. Season with salt and pepper, to taste. -If the chowder is too thick, add more milk as needed until desired consistency is reached (mine wasn’t too thick, but everyone does things a bit differently).